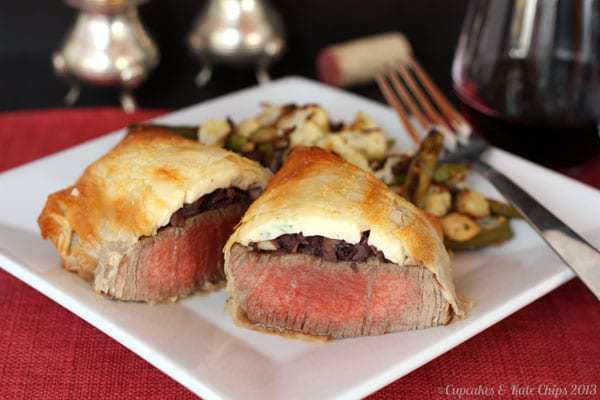 Tender filet, topped with a red wine mushroom duxelle and blue cheese, then wrapped in phyllo for a flaky crust. What better for a special occasion meal? 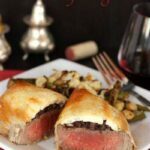 Beef phyllingtons are a tasty twist on beef Wellington, using phyllo dough as the exterior crust. Individual sized portions make beef phyllingtons a perfect Valentine’s Day dinner. 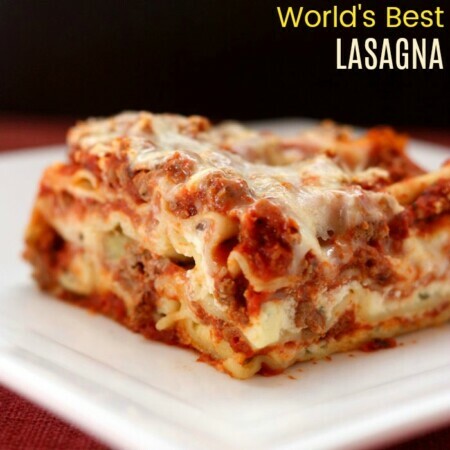 It’s a Valentine’s Day #SundaySupper! So what did I make? Chocolates? Cookies? Cake? Nope! The way to MY Hubby’s heart is BEEF!! I’ve made this recipe a few times in the past. Once when The Hubby got a new job, and another time when The Bug was itty bitty, and I wanted to treat us to a date night in. I am so excited to finally share it with you. So it is definitely a special occasion dish, and the steps and effort are evidence that this is not any-old-Tuesday fare. But you can do parts of it in advance, then just assemble everything and bake it right at the end. I combined elements of different versions of Beef Wellington that I have seen over the years. No pate, it’s just not my thing, but I had to have the mushroom duxelle. And blue cheese was a total necessity. And really, the best filet you can get your hands on. Then, in an effort to lighten things up a bit, without totally losing that flaky crust, I went with phyllo dough in place of the traditional puff pastry. Now, to be honest, I’ve never had “traditional” Beef Wellington, but I am perfectly happy with this version. 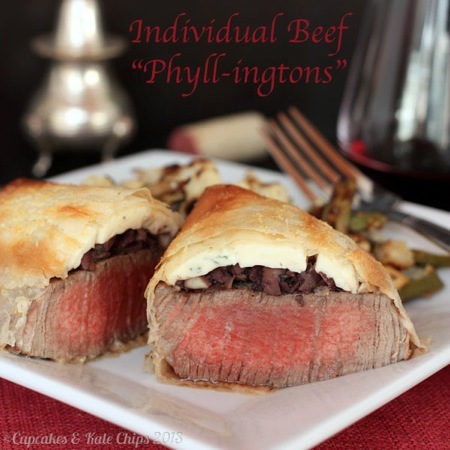 I think you will adore beef phyllingtons! You will need a knife to cut through all the layers, but the perfectly medium-rare beef will melt in your mouth. The lovely crust against the soft mushrooms, with the bite of red wine, and ooooh, the lovely tang of blue cheese that just pairs so perfectly with everything beef and mushrooms. My mouth is watering just thinking about it. Beef phyllingtons are delicious with Blue Cheese Roasted Veggies, but I think they’d also be fabulous with some Browned Butter Whipped Butternut Squash. Or a Romaine “Wedge” with Hot Maple Bacon Dressing, or Balsamic Roast Vegetables. Possibly even some Cornmeal Crusted Asparagus. The bubbles and pretty red color make a Cranberry Sparkler Mocktail (or use sparkling wine, if you would like a cocktail) a perfect drink to the occasion. And for dessert, what could be more romantic than some Chocolate Covered Cheesecake Strawberries?! 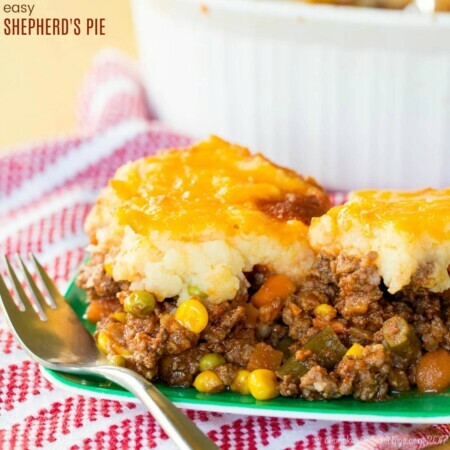 Or maybe one of the other #SundaySupper recipes you’ll find at the bottom of this post. Check out the list and be inspired to cook from your heart! Yes, totally Bug- AND Hubby-Approved! And while I hope you love this recipe, too, really, that is all that matters! Side note: maybe getting my 2 1/2 year old hooked on fancy foods like Beef Wellington is not such a good idea. Doesn’t bode well for my wallet in the future. What is the food (savory or sweet) that is the way to your Valentine’s heart? This year, consider saying “I love you” with beef phyllingtons! Add the shallot, salt, and pepper, and saute for 2-3 minutes, or until shallot starts to become translucent. Add the mushrooms and thyme, and cook for 5-8 minutes, until the mushrooms are soft, and most of the liquid has evaporated. Pour in the red wine and cook until it evaporates, about 3-5 minutes. Preheat oven to 450°F. Coat a baking sheet with olive oil or cooking spray. Heat a heavy pan (I used cast iron) over high heat until it is very hot. Coat pan well with olive oil or cooking spray. Season each side of the filets with salt and pepper. Remove the filets from the pan and set aside. Divide the mushroom mixture on top of each of the four filets. Top the mushroom mixture with about 1 oz. of cheese per filet. For each "phyllington", layer three sheets of phyllo dough, spraying olive oil or cooking spray to coat each layer. Place a filet on top of the stack of phyllo, several inches from the edge. Wrap the dough from one side over the top, and roll it up with the seam on the bottom (cut excess phyllo, if needed), tucking the ends under. Place the packet on the baking sheet. Repeat with the remaining three filets. Brush the top of each "phyllington" with the beaten egg. Bake for 9-10 minutes, or until the crust is golden. Allow to rest for several minutes before serving. The Mushroom Duxelle can be prepared in advance, and you can also sear the steaks ahead of time, then assemble and bake before serving. If you like your steaks cooked a little more than the medium rare shown here, then I would recommend thinner steaks and/or searing a little longer, as baking longer may overbrown the crust. Check out what the rest of the #SundaySupper crew is serving up for Valentine’s Day. Everything is so fabulous, you’ll feel like you’ve been shot in the behind with cupid’s love arrow. Looks absolutly delicious. My husband has been wanting me to cook this for a long time. I’m not a big fan of the pate either. This sounds amazing. I’ve got to try it. What a fabulous idea!!! These look amazingly delicious!!! This looks wonderful although I’m not a fan of mushrooms (or bleu cheese, for that matter), but my husband loves both of them. I was thinking that some lovely seasoned, grilled onions and maybe cheddar would be awesome in place of the mushrooms & bleu. What do you think? Maybe personalized Phyllingtons? I think personalized Phyllingtons sounds awesome, and I think cheddar and grilled or caramelized onions would be amazing. Now you have me wanting to try a new version. Oh, I hope they turned out well! Happy New Year! These look so so lovely! So, if you weren’t into the fungi, how would you swap out the mushroom? I have visions of a tapenade? I don’t see why you couldn’t leave out the mushrooms completely, but a tapenade would be interesting. I’ve been putting kalamata olives and my Greek yogurt blue cheese dressing on salads lately, so I can see that combo working. I was just thinking of doing this for Easter then I saw your recipe on Thursdays Treasures. Great minds think alike. Fantastic recipe. Thanks for sharing on Thursdays Treasures. Thanks for hosting. So funny that we had similar ideas in mind. Sounds like a fabulous Easter dish. Love your “Phyllingtons”! Such a great idea. Thanks Bibi! We love them! oooh yum! Wellington is one of my favorite things to make–I’ll have to try it with the phyllo dough next time! It is a wonderful dish! It isn’t too hard, just takes a little time and focus. Enjoy! 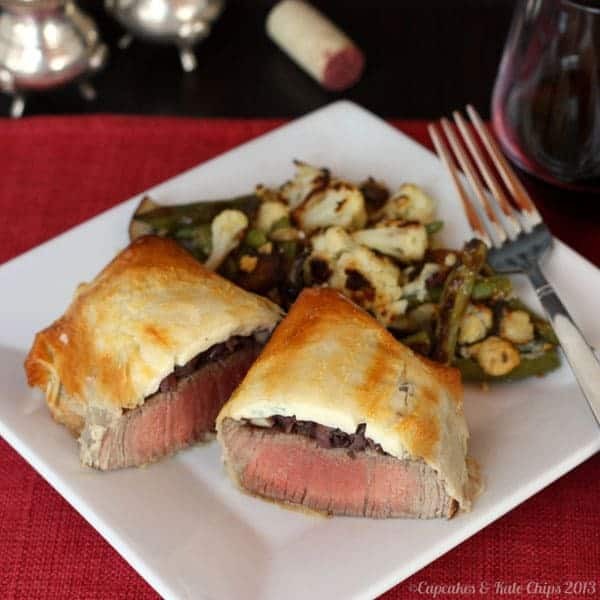 You can never go wrong with beef wellington!! Love it!! You can’t beat the classics, even when you update them a little. This make V-Day extra special! Absolutely! Although we are keeping it a bit simpler tomorrow night. My husband loves beef for Valentine’s Day too! 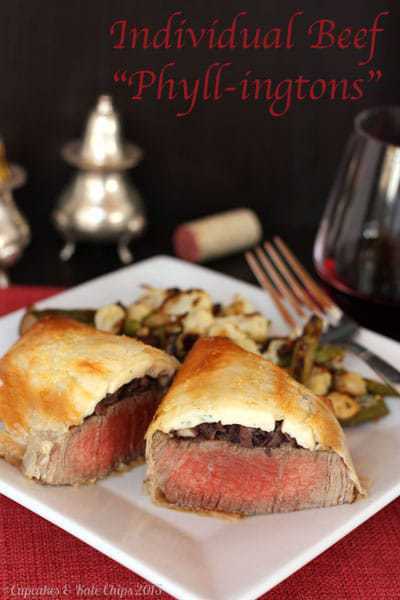 This is a great version of beef wellington! Also, I love that the bug is such a good eater at his age. Thanks! The Bug does pretty well, but he does have his typical two-year-old-picky-kid moments. But I try! Thanks so much! Happy Valentine’s Day to you, too! 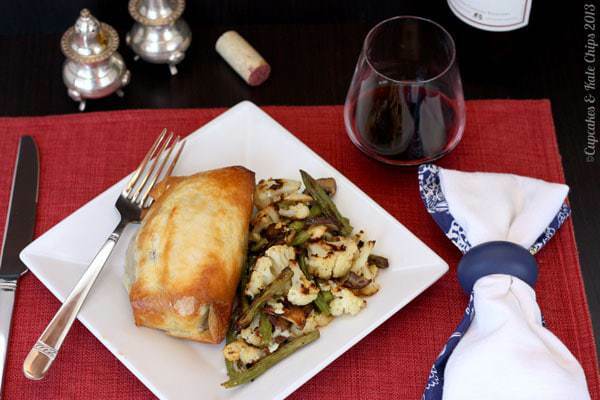 Love the crispy phyllo, and the tangy blue cheese is perfect with the beef. Nicely done! Brianne, that’s a gorgeous beef phyllington! I would’ve probably overcooked that thing like there’s no tomorrow – yours is perfectly medium rare. And while I usually cook things that are simple and quick, I love making something that is labour intensive for special occasions. The photos of the Bug and your hubby enjoying your dish are adorable. Happy Valentine’s Day to you and your family! Thanks! I had four filets, and knew The Bug needed his cooked a little more, so I knew I had two shots to test the timing for photos and to know that mine and The Hubby’s would be perfect. I lucked out – first try, and the other three came out just as perfectly. I was so excited! I’ve been meaning to make this forever! It looks so good. Beef is the way to my hubby’s heart as well! He’d love this! 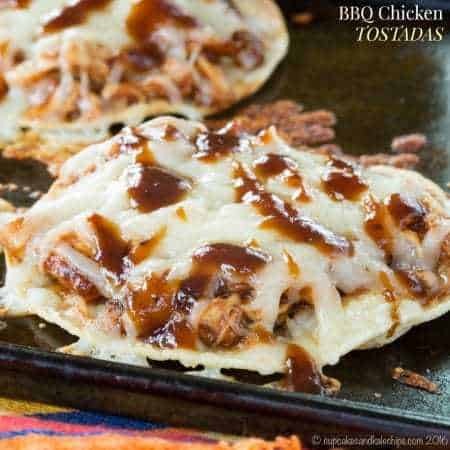 These look delicious Brianne and have been on my “to make” list for quite some time. I just never get around to it. The Bug will thank you when he’s older for introducing him to these foods when he’s younger. My oldest eats and will try just about everything! this is definitely a recipe you have to commit to getting around to. It isn’t hard, but requires some time and attention. I love that he is a good eater, just know it will get expensive 🙂 The second one will probably live on Cheerios. Mmm, I bet you could add some crumbled bacon to the mushroom mixture. We don’t have bacon too often, because it bothers Hubby’s tummy, but I bet it would taste awesome. It looks like both the men in your life adore this dish. It looks amazing. My hubs would love this. oh my goodness!! I love this! Beef is the way to my husband’s heart too. . I may have to make these on Thursday! Thanks! I’d love to hear back if you do. This looks fabulous! I’m so going to try this! I also love that your son is eating it too. Happy (early) Valentine’s Day, Brianne! I did have to cut the meat into smaller pieces and re-stuff it into the crust, but he did love it that way! Oh my YUM! I wanted to just skip to the bottom and get start in the kitchen like NOW! My husband would be goo goo ga ga over this but forget him what about me? I’m on this! Thank you for sharing! Hooooly moly. The color of the beef looks absolutely perfect. My husband would be allllll over that – looks fabulous! Thanks! Making this is always a crapshoot since you never know what it will look like when you cut into it, but I think I have lucked out every time. What a great idea! I am not a big pate person either, so I love the mushrooms instead! Yes, you get that nice soft layer, and I just love mushrooms and beef together. Haha! I do love this meal, but it is a labor of love, so I don’t make it too often. How brilliant of you to use phyllo instead of puff pastry! (I made a pot pie with puff pastry a couple of weeks ago and was shocked at what even a small portion did to my my blood sugar.) This looks like the perfect Valentine’s Day meal. Yes, I was reading the amount of carbs, and it was quite little in the three sheets of phyllo. I don’t remember what it was, but my blood sugar was well below the max 2 hours after this meal. The bottom got a little juicy, but I wouldn’t say gummy, and it stayed so crispy on top that it didn’t hurt it. I think it is better to only use a few sheets of phyllo like I did, because I think the more you use, the more gummy it could get on the bottom, and you won’t get a TON more crispiness on top, if that makes sense. WOW! I think I know what I am making for Valentines Day this year. Awesome job! Thanks! It is a great meal for a special occasion! What a fantastic idea!!! I love this!! Looks phenomenal! Definitely hubby approved here, too! I think there are a lot of hubbys who would go for a good steak! Gorgeous!! This looks like a wonderful meal for your sweetheart! Thanks! He enjoyed it! We all did, actually. Great dish – my littlest loves lamb chops..while I adore his adventurous palate I’m sure down the line he’ll need to take a part time job to support his lamb habit lol. That is awesome! I didn’t grow up eating lamb, so for some reason never make it, but my little guy loves scallops. Shoot that would win my heart over any day. Beef, blue cheese and mushrooms? Yes Please! Yum! Three of my favorite food. Luckily hubby is on the same page! The name is great and all the changes you made are perfect! I love a good, juicy piece of meat! This looks so good. 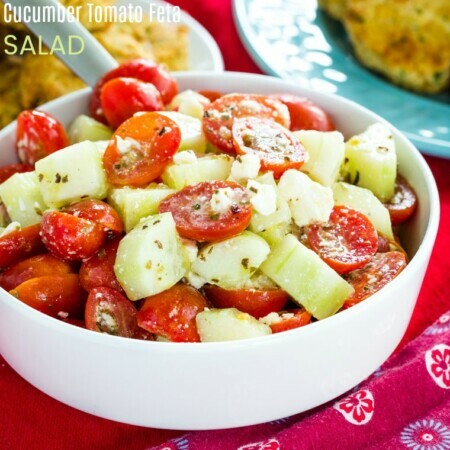 My husband would adore the blue cheese on top and I like the you can pick it up and eat it! It sounds great!!! I’ll totally try it!! Men certainly do love beef. My husband is no exception. I really like your use of phyllo. Blue cheese + beef is a true winning combination. They do, though I am a fan too 🙂 Love how phyllo keeps the crunch, but makes it not sooo rich. Oh my goodness this looks amazing. I think you have found the recipe I am going to be using on Valentine’s day. Hubby would be so excited to come home to this amazing meal. P.s. Love that you are introducing your little guy to gourmet food. Yeah, go with your man’s heart 😉 and these look delectable !! I could have these for dinner ! Exactly! I saw everyone posting that they were making sweets, and I knew I was going in a completely different direction. Nom! These are beautiful and omg, I want one. They sound so perfect Brianne! Thanks! A little bit of work, but they do end up looking impressive.